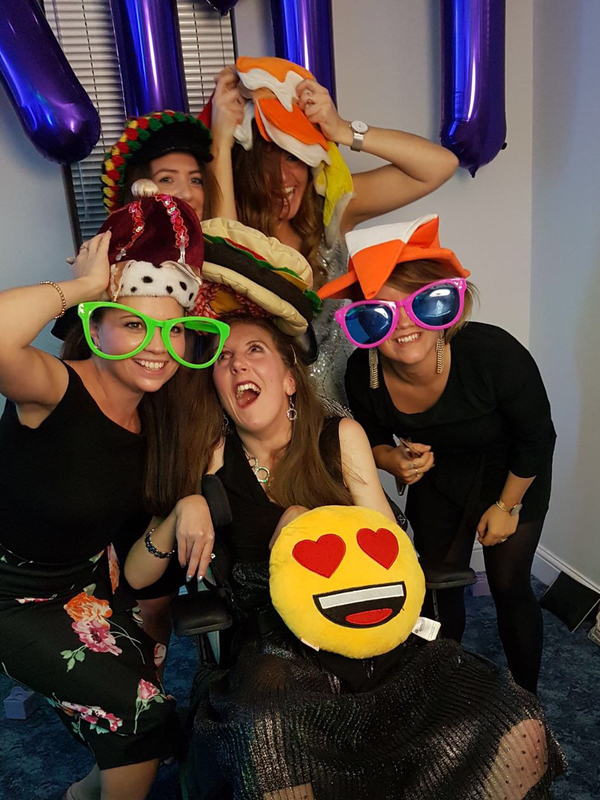 Saturday 14th October saw Amy begin the first of the celebrations for her 30th birthday, when The Amy May Trust hosted a small fundraising birthday party in The Legends Lounge of Southend United Football Club. The event kicked off with the very talented vocalist Natalie May Paris performing as friends and family arrived. As Amy's parents, Sue and Roger brought the star guest through the doors a cheer went up as our glamorous birthday girl arrived. The band You Little Thief took over from Natalie, giving their services free of charge along with their heart and soul as they played for the entire evening. You were absolutely fantastic, thank you so very much. Throughout the occasion we were looked after expertly by the staff at the club, Linda, the chef in charge of the kitchen producing a constant array of canapés served by delightful waiting staff, and Sharon, adeptly managing an extremely active bar. Simon ONeil, close up magician worked his magic around the room as people drank, chatted or had their picture taken at the photo booth. James Sharples from Southend United Football Club, who had overseen the smooth running of the event through the evening, organised the pulling of the raffle winners and prizes generously donated from local establishments, including The Roslin Beach Hotel and The Pipe of Port. A silent auction saw winners claim signed shirts and a football from Southend United Football Club, a champagne hot air balloon flight, theatre vouchers donated by YADA Events and a photoshoot by Rachel Thornhill Photography. Our grateful thanks to these individuals and companies, and others who so kindly and generously donated prizes for our evening. A Laurent Perrier toast was handed around, as family and friends sang happy birthday to Amy, and as the candles on her cake made by Maria of Ti Amo, were blown out, the wishes and hopes for a good year ahead for her flooded the room. Later, as the evening became a little more mellow, Claire, who sings classically, and who had up until that time been serving drinks behind the bar, stunned many in the audience by taking the microphone and performing 'Viva Tonight' a song filled with emotion along with 'Can You Feel The Love Tonight' from The Lion King, a musical which holds great sentiment for the family, both renditions apt and perfect for the vibe within the room. Thank you to all the loving friends and family who came along and warmly and generously supported The Amy May Trust on Saturday, you gave your time, love and your benevolence, along with sincere wishes from the heart to Amy for a very happy birthday. Enjoy your week of celebration leading up to your actual birthday Amy! I know that your devoted Mum and Dad will ensure that your special day next weekend is as special as you are to so many.